Ceramic ( Metal Free ): Advances in dental materials have allowed us to make ceramic crowns that look beautiful and are as strong as metal crowns. These new materials allow us to conserve tooth structure and eliminate the black lines seen on older porcelain metal crowns. The dentist will prepare the tooth to the ideal shape for the crown. This will involve removing most of the outer surface, and leaving a strong inner 'core.' The amount of the tooth removed will be the same as the thickness of the crown to be fitted. Once the tooth is shaped, the dentist will take an impression of the prepared tooth, one of the opposite jaw and possibly another to mark the way you bite together. The impressions will be given to the technician, along with any other information needed to make the crown. Treatment usually takes two weeks. 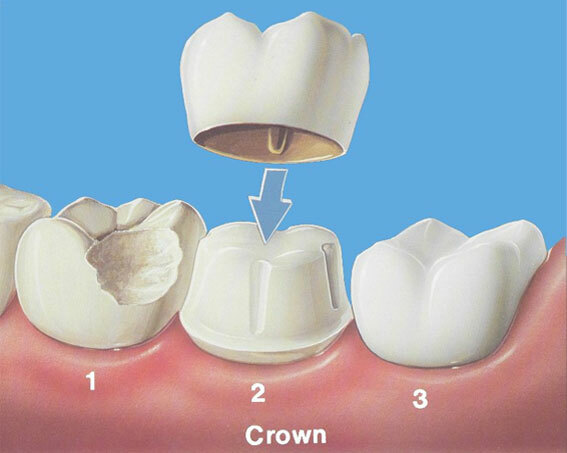 There is an initial appointment when the tooth is prepared for the crown and a final visit when the crown is cemented. During the time between appointents a provisional acrylic crown will be worn on the tooth. Sometimes a tooth needs a crown but there is not enough tooth to support it. A tooth that has received root canal therapy can have a post placed inside the tooth to support a build-up. The build-up/ post combination replaces missing tooth structure to provide a sufficient platform for the new crown. The life of a crown will depend on how well it is looked after. The crown itself cannot decay, but decay can start where the edge of the crown joins the tooth. It is very important to keep this area as clean as your other teeth, or decay may occur which could endanger the crown. Properly cared for crowns will last for many years -- your dentist will be able to advise you how long. Once the fit and appearance of the crown has been checked -- and approved by you -- it will be cemented in place with special dental cement. The cement also forms a seal to help hold it firmly in place. A dental bridge is a false tooth, known as a pontic. This is fused between two porcelain crowns to fill in the area left by a missing tooth. The two crowns holding it in place that are attached onto your teeth on each side of the false tooth. This is known as a fixed bridge. This procedure cab be used to replace one or more missing teeth. Fixed bridges cannot be taken out of your mouth as you might do with removable partial dentures.